Sometimes I get that feeling. How did we come to the state where in most cases regarding or deciding women’s issues, the deciders are all…men? And as an aside, Monstrous Regiment is one of the best books ever written on this subject (and a lot of others, Monstrous regiment multi-tasks 🙂 ). Though it is screamingly funny most of the time, it hits the nail on the head all the time. What do you think? What’s your favorite feminist book? This was the Captain Samuel Vimes ‘Boots’ theory of socioeconomic unfairness.” – Terry Pratchett, Men at arms. Paulo Coelho books are all about how easy everything is if you just do what the you are supposed to be doing. While I do believe that everyone has a purpose and a calling, you still need to be able to work hard for it. Also, Terry Pratchett is funny 🙂 What do you think? I got some Terry Pratchett books from a friend, and enjoyed relaxing with them last week. I consider Carpe Jugulum one of his best books. While making us laugh and building on every vampire cliche in the history of vampires, he also makes very astute and insightful commentary on kings, power, fear, overweight people, old people, and the human condition in general. Terry Pratchett is not called a satirist for nothing. Even though we don’t have vampires, witches on broomsticks, Igors, etc. the Discworld is astoundingly similar to ours, because the people are the same. He has you nodding and going, “You are so right!” with his descriptions of everyday situations. I actually found this a bit tedious the first time I read it. 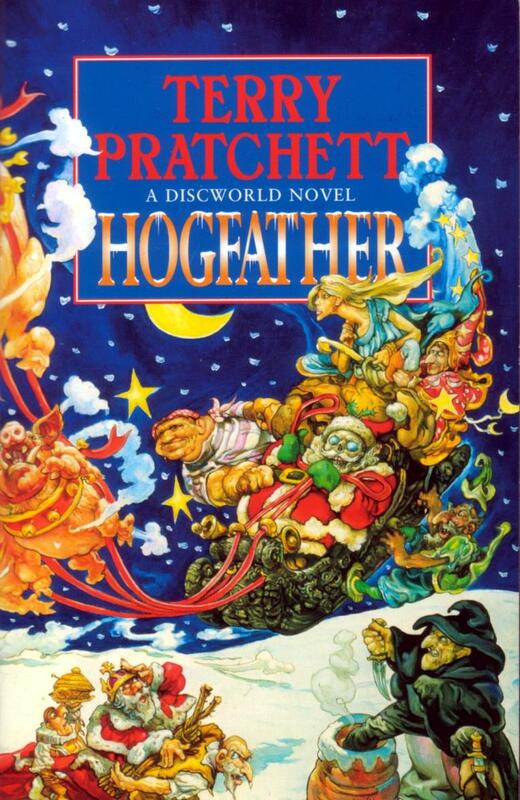 I just couldn’t drum up the energy to care if the Hogfather was dead or alive, and what that would mean for the Discworld. Maybe because I don’t celebrate Christmas? However, at some point the book picks up and reveals the absolutely brilliant plan and the next time I read it I enjoyed it more. Some parts were still tedious, but the entire book was more satisfying. Originally, I didn’t like Terry Pratchett. My first try was Pyramids, which was mediocre. I thought I didn’t like Terry Pratchett and that was that. Then I read Good Omens, with Neil Gaiman. That is one excellent book! Funny, witty, interesting, and satisfying. I doubted that everything was due to Neil Gaiman (though he is an exceptional author). Then the Light Fantastic and The Colour of Magic fell into my hands and they were good (They are the 1st and 2nd books of the discworld series). At that point I started reading everything I could lay my hands on. At the time I was a member of the British Council Library, so I had a lot of choice 🙂 And I discovered that while Pyramids is indeed mediocre, many of his other books are incredible. 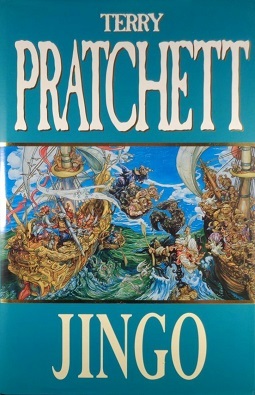 Terry Pratchett invented the discworld – a large disc carried on the back of four giant elephants crawling through space on the back of a turtle. It is a world where gods interfere in the affairs of men, where magic is more reliable than science, where there are trolls and dwarfs, gnomes and werewolves, zombies and vampires – each of them with a twist on the stereotype. And he puts a curved mirror on our own world, by taking things we take for granted and making us see them in a different light. While I loved this book, this shouldn’t be your first book in the series – it would be better to read at least one more of the Night Watch books (Guards! Guards!, Men at Arms, Feet of Clay, Night Watch) first. Jingo captures perfectly the absurdities of war, while at the same time mourning war’s inevitability. Jingo makes you think about politics and war in a different way than you did before. Jingo also looks at racism and preconceived ideas about different cultures. And Pratchett achieves this while making you laugh. In my opinion, this is one of his best books. Highly recommended. 5 stars. Note: After reading Terry Pratchett books, I love to go on the net, read the annotations, and see if there were any jokes I missed. Always a pleasure.